One simple shading system…endless possibilities. Simplified shading system. Easier to produce exceptionally natural-looking restorations using only one shade. For multi-shade techniques, you’ll be amazed at how well it blends naturally with your patients’ shades. A brilliant polish - and polish retention even better than a microfill! Clusters of nanometer-sized particles allow the restoration to maintain a smoother surface for long-term polish retention. Strength and versatility. 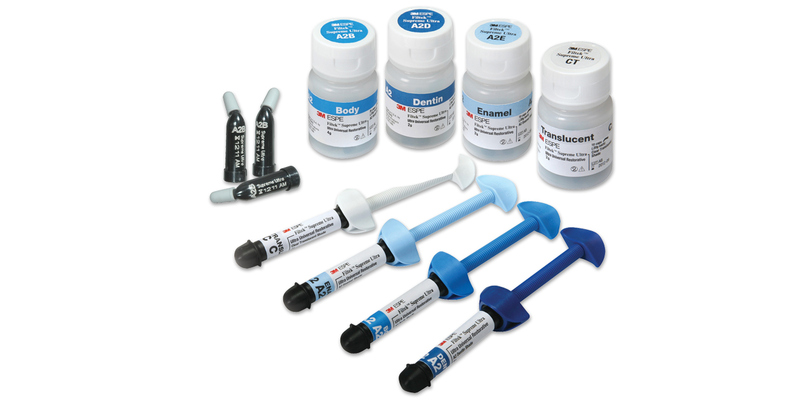 Nanofiller technology allows for greater polish retention for highly esthetic anterior work. Filtek Supreme Ultra is even strong enough to withstand the rigors of chewing in posterior restorations. Filtek Supreme Ultra Universal Restorative is a composite indicated for anterior and posterior restorations. The composite is filled 63% by volume with a combination of 4-20 nm particles and loosely-bound clusters of these particles, 0.6-10 micron in size. The composite is radiopaque. Cure times, using a high intensity LED curing light, are 10 seconds for the body, enamel and translucent shades and 20 seconds for the dentin shades. 598 restorations were placed over a 6-year period, 302 restorations were recalled. Of the 302 restorations recalled, 88 were in service 2 years, 101 for 2 to 4 years, and 113 for 4 to 6 years; 23% were anterior and 77% posterior restorations. Restorations were evaluated for esthetics, resistance to fracture/chipping, resistance to marginal discoloration, and wear resistance on a 1-5 rating scale: 1 = poor, 2 = fair, 3 = good, 4 = very good, 5 = excellent. Esthetics: Shades blended extremely well with the surrounding tooth structure. The availability of numerous shades helped in achieving superior esthetics in the vast majority of recalled restorations. 89% of the restorations received a 5 or excellent rating, 9% a 4 or very good rating and 2% received a 3 or good rating. None of the restorations were replaced due to lack of esthetics. Often the recalled restorations exhibited a very smooth and shiny surface texture with margins that were difficult to discern from tooth structure. Resistance to Fracture/Chipping: 95% of the recalled restorations exhibited no chipping or fracture. Of the fifteen restorations (5%) that chipped or fractured only 5 (1.3%) required replacement; the rest were smoothed, re-contoured or repaired with flowable composite. Resistance to Marginal Discoloration: 91% of restorations had no visible staining at the margins and received a 5 rating. 8% had minimal staining at the margins not requiring replacement with a rating of 3 or 4. Only 1% of the restorations needed to be replaced due to marginal discoloration, probably as a result of the bonding agent. The bonding agents used were: 5th-, 6th- and 7th-generation bonding agents. Wear Resistance: 97% of the recalled restorations exhibited no wear while 2% exhibited minimal to moderate wear with a rating of 4 or 3. Only 1% of the restorations required replacement due to excessive wear. These restorations had wear at the incisal edges of upper or lower anterior teeth as result of bruxism. Overall, Filtek Supreme Ultra Universal Restorative performed exceptionally well in the categories of esthetics, resistance to fracture/chipping, resistance to marginal discoloration, and wear resistance. Two other areas of interest that THE DENTAL ADVISOR tracked were the number of restorations replaced and those that debonded. 13 restorations debonded, 10 were facial and 3 were incisal. This is often due to the bonding agent and technique. 43 restorations (14%) were replaced. The most common reason for replacement was decay (8%), fracture/chipping (3%), marginal discoloration (2%) and wear (1%). Another 1% were repaired due to open contacts or after root canal treatment or fracture of the tooth. These were not material related. Filtek Supreme Ultra Universal Restorative received a clinical performance rating of 98% at six years. Filtek Supreme Ultra earned 4.5 stars out of a possible 5.0. Very complete shading system. Body versions tend to be very close to universal translucent/opaque shades and good for Class III and V restorations. Colors seem to blend very well into tooth structure. Easy to handle with instrument or brush. Not overly stiff and has minimal stickiness – still sculptable. Very good polish that has more durability than previous versions. Minimal voids. Slightly exceeds 80% cure goal. Fluorescence is close to tooth structure. System is well organized. Most (67%) evaluators consider it to be better than the previous version, while the other 33% could not tell the difference between the two versions. At least five evaluators mentioned that it still has a tendency to have a grayish effect, especially with the lighter body shades. No organizer for syringes. The cutting of the material from the syringes on a pad may produce a fraction that looks white and dry. Working time is mediocre. Enamel bleach shades could be lighter. Not perfect, but the combination of logical shading and exceptional handling takes it to the head of the class.